(Orlando Sentinel) --- A tumultuous week ended with a bombshell that is sure to ratchet up the anger and tension surrounding the shooting death of teenager Trayvon Martin. A series of 911 calls from the last moments of Trayvon's life were supposed to shed light on why police have not arrested the shooter, crime-watch volunteer George Zimmerman. Instead, they have fueled even more rage — not just in Central Florida, but across the country. Trayvon's family and supporters vow they won't give up until Zimmerman is charged with the 17-year-old's slaying late last month. At the heart of this maelstrom — in which the thorny issues of race and justice have surfaced as themes — is a boy who dreamed of becoming a pilot and liked to work with his hands. After taking an airplane ride two years ago, Trayvon decided he wanted to learn to fly, his uncle Ronald Fulton said. The teen attended a Miami aviation school part time and was studying to be an engineer, a path to realizing his ambition, Fulton said. Math was Trayvon's favorite subject. He liked to tinker, and he was good with his hands. He once took apart and repaired a broken scooter, Fulton said, and he liked to construct model cars and airplanes and draw pictures of things he wanted to build. "He was extremely creative," said Michelle Kypriss, Trayvon's English teacher at Dr. Michael M. Krop Senior High School in Miami. "He just loved building things. He really was intrigued by how things worked." She described Trayvon, a junior, as an A and B student who majored in cheerfulness. 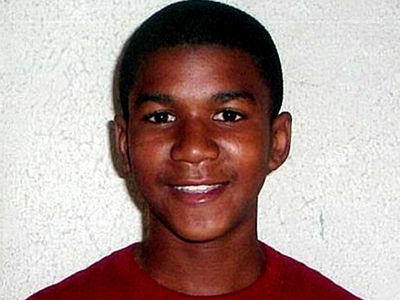 His uncle said Trayvon was still a typical kid who loved sports, music and was just feeling the first flush of youth. "He was trying to start driving. He was just finding out about girls." Trayvon was close to his 21-year-old brother Jahvaris, also of Miami, and assisted his uncle, a quadriplegic, on outings to University of Miami basketball games. "He used to help me," Fulton said, voice breaking. Trayvon — who was known as "Tray" or "Slimm" — played youth football during his early teens and helped his father coach Little League baseball, said Fulton, whose sister, Sybrina Fulton, is Trayvon's mother. Trayvon was under a five-day suspension when he was shot that Sunday night, but Kypriss said it was due to tardiness and not misbehavior. "Trayvon was not a violent or dangerous child. He was not known for misbehaving," the teacher said. "He was suspended because he was late too many times." Grief counselors were at the school for several days after Trayvon's death. Kypriss expects students to remember their missing classmate when they return from spring break Monday. A reported 1,000 people, including his classmates, attended the teen's March 3 funeral in Miami. "I don't think he'll ever be forgotten," Fulton said. "As long as I live, as long as everybody that came into contact with him lives, Trayvon will live." Police said they hoped releasing the 911 calls surrounding the altercation and shooting would help clarify why they didn't arrest Zimmerman. But in a call to the Police Department's non-emergency line, Zimmerman can be heard pursuing the boy, even after dispatchers tell him not to. He describes Trayvon as a black male who looked like he was "up to no good." He begins the call by saying there's been a rash of break-ins in the neighborhood. At one point in the call, Zimmerman says: "These assholes, they always get away." In the 911 calls, neighbors described an altercation between the two men. On one call, screams can be heard, and then at least one gunshot. After the recordings were released Friday night, Twitter exploded with thousands of emotional responses, comments and even threats. •"My 15 y/o, 5'9" son left home tonite wearing a hoodie. Who might think him threatening enuf that he shouldn't make it home? #Trayvon." •"#TrayvonMartin is the reminder we need to fight for justice and equity. All our brown sons remain at risk." George Zimmerman wanted to be a police officer, and sometimes his aspirations led to action. When he saw a 24-year-old Lake Mary man shoplift a 24-inch TV from an Albertsons supermarket in 2003, he called theSeminole County Sheriff's Officeand followed the suspect's car for several blocks, allowing a deputy to make an arrest, records show. The next year, Zimmerman followed a man who allegedly spit at him while driving, according to an incident report. The other driver accused Zimmerman — whom he described as "irate" — of tailgating, and was not arrested. Though there are no enrollment records suggesting Zimmerman has attended a law-enforcement academy, he carried a concealed weapon and expressed his desire to wear a badge. He's currently enrolled in a general education program at Valencia Community College. I really hope all the attention to this case leads to the first step towards justice in arresting this man. The 911 tapes are so chilling. I am all in with this one. Completely livid! This case just makes my teeth itch.... NOTHING was done right.. How could the police believe these tapes justify not arresting the man??? First a 911 operator tells him to STOP following the boy. How do the police justify him ignoring a command from law enforcement officer??? Now his judgment is superior to hers??? She's trained, he's not. If a police officer had told him to freeze and he hadn't wouldn't that be considered resisting arrest?? Secondly, the police SHOULD know and understand the legal definition of self defense...and He hit me first doesn't cut it.... The neighbors say they hear a scuffle...how does being in a fight justify you using a gun to shoot a kid that you had no authority stop in the first place??? He was not on this guy's property...He's on a neighborhood street and his description of the kid as "on drugs" or something really pisses me off... because we all know that walking is a sign of rampant drug use... that's all crackheads do, get high and start walking...I'm confused how he was supposed to burglarize a house while walking anyway. how was he going to carry the loot??? Thats so wrong! My prayers goes out to the martin family. This is a shame racism still exist after all these years which leads me to wonder when will it ever stop! That animal should be executed! Lock him up and throw away the key! I hear all of the concern for this seventeen year old kid. My heart goes out to his family in the fact that a life was lost. My question for this listening audience is where is the out cry when blacks kill each other almost every single day. Is this different because someone of another race killed a black person. The same kind of out cry that's going out over this should not just happen when someone of another race kill a black person, but when any person is killed in a violent manner. People please wake Up! Oh and by the way I am black woman with a teenager, but I know where she is at night.